33-year-old woman from Qena in Middle Egypt. She was a columnist for the al-Dustur (Constitution) independent newspaper and worked for the Arabic Network for Human Rights Information, which is a media platform for several organisations for the protection of human rights from the Middle East. As a representative of Arabic oral tradition, she is also a skilful storyteller interpreting texts by Naguib Mahfouz, Mikkawi Sayed as well as her own texts. 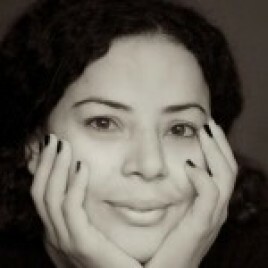 On her blog Diary of a Spinster kept since 2008, Soliman tells stories of unmarried Egyptian women aged above 30, which are partly fictional and partly based on her own experiences and hearsay. Due to economic and cultural reasons, the problem of spinsterhood in Egypt is particularly serious and affects around 30% of women aged above 30. Entries from Soliman’s blog were published in 2010 and became a bestseller – the first edition of the book was sold out almost immediately. Picture: Jean-Luc Marchina A meeting with Abeer Soliman will take place on 23rd October in The Pod Baranami Palace. She will participate at The Night-time Reading in Cafe Szafe on 23rd October at 21:00 as well.